DAVID JANEWAY was born in Rochester, New York. He began studying classical piano at the age of six after moving to Detroit in 1960. Early influences included Harold McKinney, Marcus Belgrave, Bill Evans and Denny Zeitlin. After moving to New York City in 1978, Janeway studied with the late Albert Dailey for two years. During this time he worked and recorded with Angel Canales and Orchestra Sabor and other Latin/Jazz artists such as Art Farmer, The Supremes, Michal Urbaniak, Spanky Wilson, David "Fathead" Newman, Jr. Cook, Sonny Fortune, Billy Hart, Tom Harrell, Danny Gottlieb, Louis Smith, Dakota Staton, Valery Ponomarev, Benny Golson, Harvie S and others. He has performed at Zanzibar, Visiones, Sonny's, Village Gate for the Salsa Meets Jazz series, J's, Sweet Basil, Sweet Rhythm, Cleopatra's Needle and other NYC clubs. Janeway performed at the NYC Salsa Festival at Madison Square Garden in 1980, the Detroit Jazz Festival along with other festivals and clubs throughout the US and Europe. "Janeway's compositions and improvisations reveal an intensely dedicated and sensitive individual. While his driving power and intricate rhythms earned him comparisons to McCoy Tyner, make no mistake, his is an artist with an undeniably unique voice. Drawing upon his Latin music experience, he often spices up his music with unexpected salsa turns and twists that make for passionate solos." For the past several years he can be heard performing with his trio and as a sideman with various artists. The trio is featured on his latest CD, "Secret Passages" released in 2017. Pianist David Janeway, with only a handful of albums under his belt, bursts out of the pack with the exciting Excursion. He is accompanied by veteran bassist Harvie S and drummer Steve Davis. Excursion also features a guest appearance from trumpeter Charles Moore, who provides an eerie and effective Miles Davis vibe on Janeways's ballad, "Another Chance". These dozen tracks are comprised of half originals from the pianist and the remainder from the Great American Songbook and jazz standards. It is as good an indication of Janeway's writing that the title tune sits between the Cross/Williams standard, "I Should Care," and Joe Henderson's "Black Narcissus." It is no small feat to say that not only is Janeway's playing sparking but so is his ability to write tuneful compositions. The liner notes make a point of comparing Janeway with McCoy Tyner as an individualist pianist. Tyler may not be a specific reference point, but Janeway's individuality as a player is evident right from the opening notes of "Viscosity." Janeway and this well-meshed trio leap sure-footedly into the tune with fresh ideas. Janeway also has a propensity to launch into Latin phrases quite unexpectedly, adding to the improvisational aspect of his delivery. Janeway was born in Rochester, New York, relocating to Detroit and was a student of the late pianist Albert Dailey. 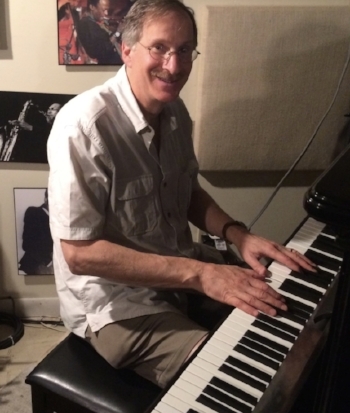 He has the experience of working at several important New York venues and with many jazz notables. His first albums Entry Point (New Directions, LP 1986 and CD reissue 2016) and Inside Out (Timeless, 1993) both included horns like Sonny Fortune, Marcus Belgrave and Bob Berg. This album is a fine opportunity to appreciate Janeway, the composer and stylist, in a trio format. Released on New Directions in 2007 and available on I Tunes, Amazon, CD Baby, Spotify. The former Detroit-to-Lansing based pianist, now in New York working as a psychiatrist and jazz musician, has this, his second CD released on the Dutch based Timeless label. It features six originals and one standard, the delicate, "Three Little Words." This straight-ahead ensemble takes only a few chances within the post-bop idiom. They occasionally pop off in a modal framework, with a singing sound that fairly jumps out, especially on the dedication to Kenny Dorham, "Uncrowned King", which leads off the CD. Janeway has chosen some heavyweights for help. Drummer Billy Hart, who is the driving force here throughout, provides the percussive propulsion in his own inimitable and professional way. Sonny Fortune, a Coltrane disciple with an original voice on alto sax and flute, takes the band to a higher plateau. And there's an occasional burst from Russian trumpeter, ex-Art Blakey sideman, Valery Ponamarev. There is a strong feeling of democracy here as Janeway adds to the group feeling by not dominating. Like the bands of Blakey, Horace Silver and Duke Pearson, Janeway does not lead by example, he merely chooses familiar pathways and lets his quite able sidemen lead the way. This is pleasant contemporary jazz this is easy to enjoy. Janeway is playing a lot with Latin bands in NYC but this is not reflected on this disc. Perhaps the next release will tell further of his excursions, and expose personal vistas into the inner psyche of his own being. For now this will do just fine. CD available at Amazon, I Tunes, CD Baby, Spotify.